Dublin Bus is the largest public transport provider in the Greater Dublin Area (GDA). We have been part of the fabric of Dublin life since 1987. Our CR vision is ‘To drive Dublin life forward by supporting, improving and enhancing the lives of the people and the communities that we proudly serve’. Our Community Spirit Awards (CSAs) provide voluntary groups across the GDA with support to develop new projects and grow services in their local community. Each year over 80 groups are awarded grants from €1,000 to €5,000 and to date, over 1,800 voluntary groups have benefited. The National Family Support Network (NFSN), located in Dublin 1, was one of five winners to receive a top award of €5,000. NFSN is an autonomous self-help organisation that respects the lived experiences of families affected by substance misuse, in a welcoming non-judgemental atmosphere. NFSN primarily supports the development of family support groups and networks throughout Ireland. 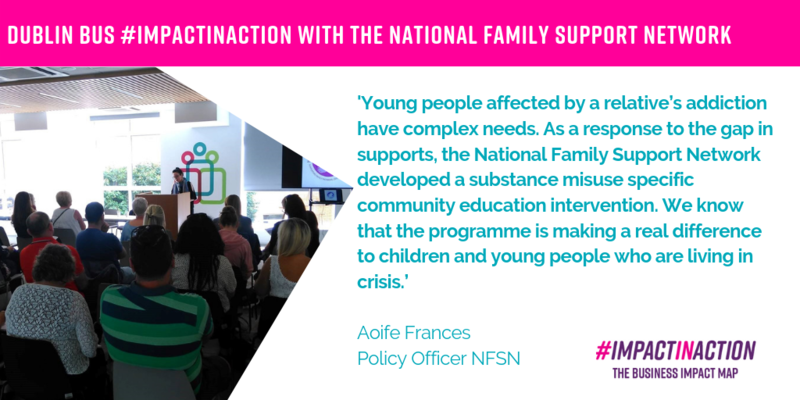 The funding was used to support the NFSN’s Young Persons Support Programme (YPSP) in 2018. The YPSP is a structured programme delivered to 11-17 year olds living with parental or sibling substance misuse. Research has shown that there are approximately 27,787 children under 16 in Ireland living with a drug dependent parent, and 62,290 children under 16 living with an alcohol dependent parent. The NFSN promotes the programme to youth workers nationally, who can take on the intervention programme and run it in their service. NFSN had only been able to access their YPSP manual online. The funding provided to them under the CSAs allowed them to print copies of their manual and to disseminate them among youth and community workers who facilitate the programme with young people affected by substance misuse, which made a huge difference in how the programme was promoted and utilised. The funding was also used to re-launch the programme in July 2018. Dublin Footballer Philly McMahon spoke at the launch, alongside youth workers who had run the programme and the event was attended by over 25 organisations who work with vulnerable young people and who were interested in facilitating the programme in their area. Last year six Young Person Support Programmes were held in youth services/community drugs projects across Ireland, with an average of between 6-12 participants aged between 11 and 17. NFSN organised five regional information sessions on the programme, which were attended by 102 people, representing 28 organisations.